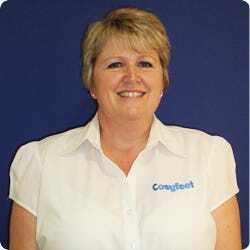 Michelle is a foot health practitioner with swollen feet who enjoys walking. She has wear-tested Moose on a variety of terrain including grass, mud, roads, tracks, stone and sand. "Superbly comfortable, decent sole – can't feel stones through it which is important for me as a diabetic as my feet are sensitive. Soft padded collar gives support without hurting. Feet stay cool and dry." To read Michelle’s fit test please click here. 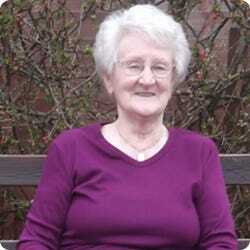 Betty has been a Cosyfeet customer for 13 years since her feet and ankles began to swell following a hip replacement. Betty admits that she struggled to find footwear prior to this as her feet are wide and she has a high instep. Over the years, Betty has worn a number of Cosyfeet styles but she particularly likes Cosyfeet elastane shoes as they are so comfortable. Please click here to view Betty's fit test. 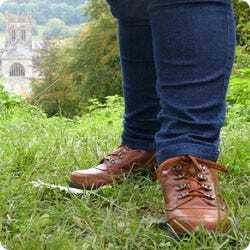 Cosyfeet footwear is specifically designed for people with swollen feet rather than for diabetic feet. However, we are aware many of our customers are diabetics and we discuss their requirements when designing footwear. Cosyfeet designer, Nick Brown explains “We carefully consider the position of seams and are pleased to offer many styles with no seams at all in the toe area”. In addition, particular materials offer anti-fungal benefits, another consideration for the health of diabetic feet. Please click here to view Louise's fit test.